Whether you’re looking to book a hen or stag party, simply shop for wedding ideas, or get married in the striking local Catholic cathedral, the ancient town of Arundel in West Sussex has it all! 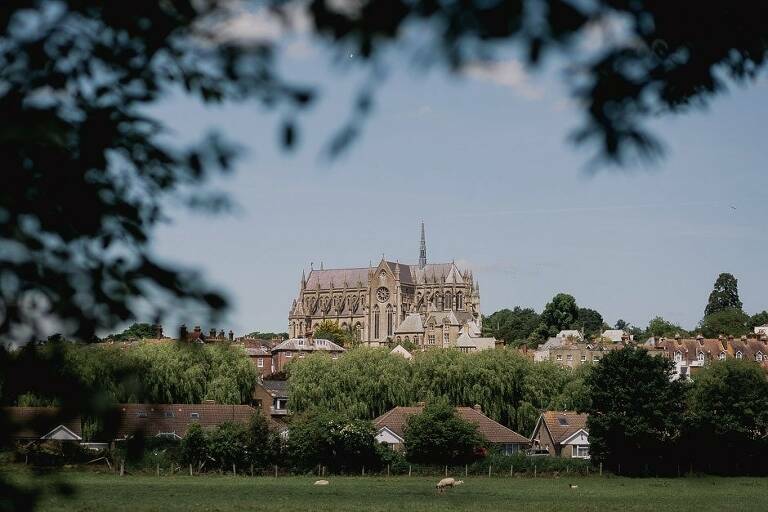 Easily accessible from the A27, the town boasts the second largest castle in the country, which along with the Cathedral Church of our Lady and St Philip, dominate the skyline and offer endless photographic opportunities which will evoke many happy memories for years to come. Arundel Cathedral is an architecturally stunning building, which was dedicated in 1873 as the Catholic parish church, and later in 1965 became a cathedral. And what a cathedral it is with its beautiful stained glass windows, chapels and Gothic arches! The nearby River Arun meanders through the centre of the town, while the cobbled streets, historic buildings and the castle will all provide a variety of romantic backdrops for your wedding pictures, adding to the unforgettable memories of your unique day. There are numerous shops in the town, many of them just waiting to help you prepare for the Big Day. You’ll find: bridal outfitters, hairdressers, beauticians, florists and ring makers, to name but a few. There is also a fine choice of grand hotels in the area offering quality accommodation. This really is a fine wedding venue in Sussex if you’re looking for the wow factor! The Carpet of Flowers in the cathedral, is a colourful annual event held in June, a celebration of Corpus Christi, and a must for anyone who enjoys floral arrangements in an exclusive setting. Arundel is well known as one of the most idyllic wedding locations in the South of England. Arundel itself is fun and cosmopolitan, capturing the essence of heritage, urban chic and country pursuits. Arundel Cathedral is indeed an ideal wedding venue for you and your partner to celebrate your special day along with close friends and family. Address: London Rd, Arundel BN18 9AY. If you’d like to enquire about my availability for Arundel Cathedral please get in touch here.